There are many blogs that I turn to on a daily basis for different reasons. If I feel like browsing delicious recipes that are mostly achievable for the likes of me, I head over to Liberty London Girl. 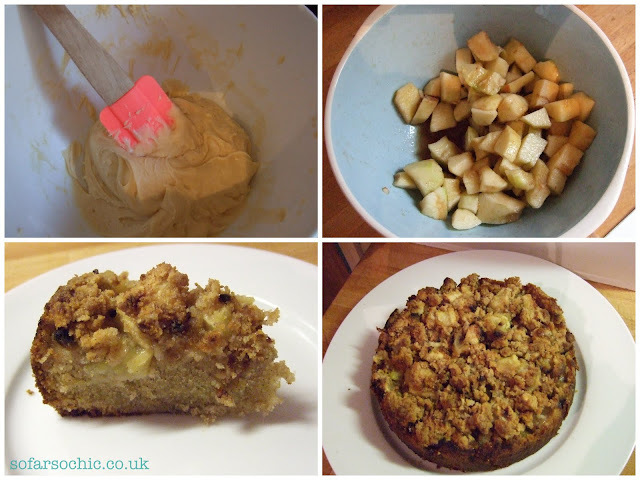 I've been meaning to make her caramelised apple cinnamon cake for a while. I mean, gooey, apply, crumbly goodness? What's not to like! Last Sunday, to a soundtrack of The Police, I happily peeled and chopped and whisked my cake together (for quite a while, I must say!). Cooking in my mother's kitchen has the advantage of providing access to every bowl, utensil and gadget a person could wish for. The spices left over from the 1970's are another bonus. Sell-by dates? Pah! Dried spice doesn't go off! Look at this antique! Perfectly good still. I should know, I've eaten most of it.